Evidence that supporting each other saves lives. Recipients of Lemonade Fund grants say that money is not the only good thing about being getting a grant. Many have said that they love knowing that there are people ‘out there’ who care about them. We could even say…this is our own brand of medicine. Last Updated: November 13, 2012. For women with early-stage breast cancer, large social networks predict better prognosis, and this association varies based on social support and burden, according to a study published online Nov. 9 in Breast Cancer Research and Treatment. TUESDAY, Nov. 13 (HealthDay News) — For women with early-stage breast cancer, large social networks predict better prognosis, and this association varies based on social support and burden, according to a study published online Nov. 9 in Breast Cancer Research and Treatment.Candyce H. Kroenke, Sc.D., M.P.H., from Kaiser Permanente in Oakland, Calif., and colleagues examined how the levels of social support and burden influence the association between larger social networks and lower breast cancer mortality. Data on social networks were assessed from 2,264 women from the Life After Cancer Epidemiology study who were diagnosed with early-stage invasive breast cancer between 1997 and 2000.During a median of 10.8 years of follow-up there were 401 deaths, 215 of which were from breast cancer. The researchers found that social isolation was not associated with recurrence or breast cancer-specific mortality. Socially isolated women had elevated all-cause mortality and mortality from other causes (hazard ratios [HRs], 1.34 and 1.79, respectively). The associations were modified by levels of social support and burden. Higher all-cause mortality was predicted for those with low, but not high, levels of social support from friends and family, lack of religious/social participation (HR, 1.58), and lack of volunteering (HR, 1.78). In a cross-classification analysis, compared with women with large networks and high levels of support, women with both small networks and low levels of support had significantly increased mortality (HR, 1.61), while those with small networks and high levels of support had no increased risk of mortality (HR, 1.13; 95 percent confidence interval, 0.74 to 1.72).”Larger social networks predicted better prognosis after breast cancer, but associations depended on the quality and burden of family relationships,” the authors write. Yesterday evening, David and I were driving to a doctor’s appointment in Rishon Letzion, a suburb of Tel Aviv. I wasn’t anxious about the appointment, nor was I nervous about venturing out of our relatively sheltered northern community. Life in the center of Israel (as opposed to the South, where rocket fire has been relentless and terrifying) has been intentionally ‘business as usual.’ Sirens have sounded in Tel Aviv a few times, and citizens take them seriously, all running to shelter, but then it’s back to work and school. Just a few minutes ago, news came in about a bus bombing in Tel Aviv; early reports are of twenty-one injured. Everyone is jittery, but Israelis are a tough lot; resistant to giving in to terror. Even after this latest event, people will quickly be back at their desks. As we approached Rishon Letzion, I noticed people stopping their cars on the side of the road and leaving them. 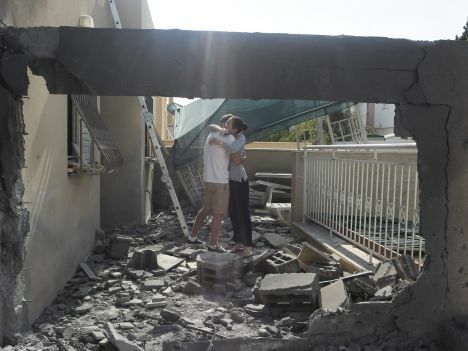 We didn’t realize what was happening at first but then I heard the siren, warning of an incoming Gazan rocket. Fifteen seconds to take cover. We stopped the car, got out, and crouched nearby. Time is suspended during such moments as one helplessly waits for…what? The overwhelming feeling was one of profound helplessness. Prayer, as usual, was a good option, and I imagine God is getting quite an earful lately. We soon heard a large explosion and saw the sky light up, not very far off in the distance. There was no way to know if the new Iron Dome Defense system had intercepted this incoming rocket, destroying it before landfall, or if it had hit a mark. We all got up, shakily, climbed back into our cars, and continued on our way. 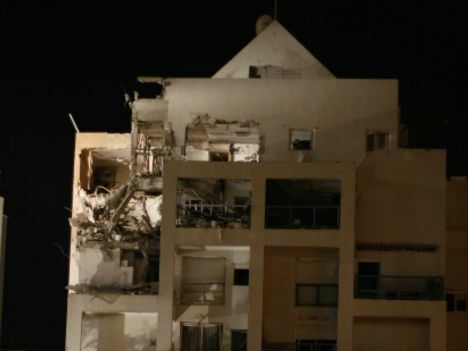 Within minutes the radio was reporting a direct hit on an apartment building in Rishon, casualties, unknown. We soon learned that the top three floors of an apartment building had been destroyed, however, miraculously, no one had been killed. People are heeding the siren alerts, and this is saving countless lives, but the internal cost of living under such stress is incalculable. Reports are of PTSD (post traumatic stress disorder) in as much as 75% of the children in the south. Having experienced a ‘Tzeva Adom’ (red alert) even once, I’m not sure why the number isn’t closer to 100%. Who can live like this? The Lemonade Fund (www.lemonadefund.org) aka, the Israel Breast Cancer Emergency Relief Fund, is more important than ever during these difficult times. It was created to help reduce external stresses on seriously ill breast cancer patients so they can concentrate on the all important task of getting well. Because no one should have to be very sick and very poor at the same time. Grants are given during the immediate post diagnosis period to worthy applicants from all over Israel; from all races, religions and nationalities. Five grants were awarded this morning. Coincidentally, all of the applicants were from Tel Aviv or south. One of the applicants, M.M., 53, is a single mother, newly diagnosed with breast cancer, who hails from Netivot, a community in the near the Gaza border that has been especially hard hit by rockets. The letter from her social worker describes a woman who has been very strong even after the recent death of a daughter (who had Down’s syndrome.) She has another daughter, 18, who helps her, but M.M. has a long road ahead. She is currently receiving neoadjuvant therapy to shrink her tumor so that she can have surgery. After that she’ll need 6 weeks of daily radiation. She is unable to work, and they are in severe economic crisis. How fortunate that the Lemonade Fund exists and is able to help her. I remember that it was hard enough to be sick during peace time, when appointments are kept and treatments stay on schedule. It is impossible to imagine the stress on the seriously ill, in war time. Health and social services are taxed to the limit. All but emergency care is curtailed. Even if appointments are not cancelled, leaving the house and going to the doctor is dicey (as I saw last night.) Lessening the financial burdens on these patients right now is an act of incredible kindness. Please consider making a contribution to the Lemonade Fund.